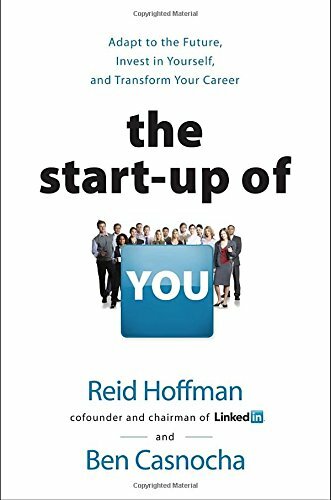 Here, LinkedIn cofounder and chairman Reid Hoffman and author Ben Casnocha show how to accelerate your career in today's competitive world. The key is to manage your career as if it were a start-up business : a living, breathing, growing start-up of you. Thomas L. Friedman is a New York Times foreign affairs columnist, three-time Pulitzer Prize winner, and author of international best seller Hot, Flat, and Crowded. Whatever you may be thinking when you apply for a job today, you can be sure your prospective employer is thinking this: Can this person add value every hour, every day--more than a worker in India, a robot, or a computer could? Can he or she help my company adapt by not only doing the job today but also reinventing the job for tomorrow? And can he or she adapt with all the change, so my company can adapt and export more into the fastest-growing global markets? In today's hyper-connected world, more and more companies cannot and will not hire people who don't fulfill those criteria. This is precisely why LinkedIn's founder, Reid Garrett Hoffman, one of the premier starter-uppers in Silicon Valley--besides cofounding LinkedIn, he is on the board of Zynga, was an early investor in Facebook, and sits on the board of Mozilla--has written The Start-up of You, coauthored with Ben Casnocha. Its subtitle could easily be: "Hey, recent graduates! Hey, thirty-five-year-old midcareer professional! Here's how you can build your career today." Here is our brief chat about their book. Tom : You're a serial entrepreneur and venture capitalist. Why did you feel the need to offer this message? Reid : As you write in That Used to Be Us, our country faces enormous challenges. The path to the American Dream has changed. We wanted to focus on what individual professionals can do to survive and thrive in a flat world. The premise of the book is that all of us are entrepreneurs of our own lives. We must act as CEO of our careers, take control of our professional future, and become globally competitive. Tom : Really? Anyone can be an entrepreneur? Really? Even me? Reid : Not only can anyone be an entrepreneur, but they must be. Even you, Tom! Not everyone should start companies, but everyone must be the entrepreneur of his or her own life. The skills people need to manage their careers are akin to the skills of entrepreneurs when they start and grow companies. For example, entrepreneurs can both be persistent on a plan and flexible when conditions change. They take intelligent risk. They build networks of allies and tap those networks for intelligence on what's happening in the world. Silicon Valley's most innovative entrepreneurs possess unique skills--you can learn them and apply them, no matter your profession. Tom : Who is the target audience for this book? Reid : Jeff Bezos says that at Amazon.com "it's always day one." This is a book for people just starting out, and it's equally for people midflight in their career who need to reinvent, restart, or reimagine their career as if it were day one, as if they were in permanent beta. We think that's most people, and eventually everyone. Tom : What does it mean to be in "permanent beta?" Reid and Ben : Technology companies sometimes keep the "beta" label on software for a time after the official launch to stress that the product is not finished, so much as ready for the next batch of improvements. For entrepreneurs, finished is an F-word. Great companies are always evolving. Finished ought to be an F-word for all of us. We are all works in progress. Each day presents an opportunity to learn more, do more, be more, grow more in our lives and careers. You will need to adapt and evolve forever--that's permanent beta. Tom : Why the urgency of The Start-up of You? Reid and Ben : A billboard that once ran along the 101 highway in Silicon Valley summed it up pithily: "A million people can do your job. What makes you so special?" We wanted to give people tools to take control of their lives, without having to wait around for the government or a company to rescue them. Tom : Is China going to eat America's lunch? Reid and Ben : National competitiveness is really a reflection of the individual competitiveness of its citizens. The question for each American is, "Is a professional in China going to eat your lunch?" Some will be competitive, and some will not. And the distinction is not set in stone. Just look at Detroit. All of us need to have a plan for investing in ourselves every day.